The bathroom was very small, this mirror was in the middle. 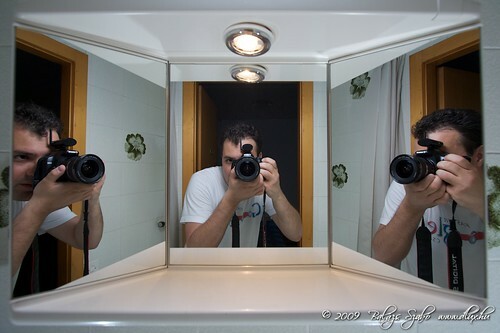 I put one flash (580 EX II) on the top of the mirror with a LumiQuest Softbox III as the main light, it was directed to my face and the camera. I think it was set to 1/32 power or something like that. I had my other two flashes (an 580 EX II and a 430 EX II) on the floor pointing upwards to the ceiling set to 1/64 power on my both sides. The lamp above the mirror gave just enough light to be able to focus with the camera, but other than that it was totally dark in the room. The triggering was done with the Cactus V4s, though I think infra would work, too. (In a small space, infra can bounce from the walls, and there is a big chance to hit the destination. Unfortunately outside it did not work for me). Besides being dark and having hard time focusing, I had to bend when I did the shot, so that was very tiring. I was not really satisfied with the sharpness of the image, so later I even tried some shots with a tripod. Those photos were sharper, but I finally chose one for posting from the earlier ones. I had only a limited time for this experient, since it was pretty late, and next day we had to wake up early for the Swiss Miniatures (see here and here).